^ 不畏塔利班死亡威胁返国 巴前总统穆沙拉夫图东山再起. 联合早报. 2013-03-25. 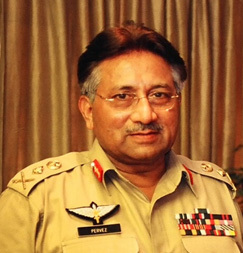 ^ Pervez Musharraf out of Pakistan election race. The Times of India. [16 April 2013]. ^ In Pakistan, Musharraf placed under house arrest. CNN. [18 April 2013]. ^ 6.0 6.1 Pakistani police arrest Pervez Musharraf in Islamabad. BBC. 2013-04-19 [2013-04-19].